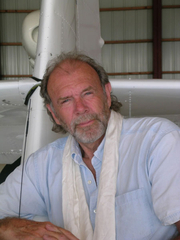 Richard Bach, a pilot and aviation writer, achieved success as a new age author with the publication of Jonathan Livingston Seagull, a novel that Bach maintains was the result of two separate visionary experiences over a period of eight years. Bach's simple allegory with spiritual and philosophical overtones received little critical recognition but captured the mood of the 1970s, becoming popular with a wide range of readers, from members of the drug culture to mainstream Christian denominations. A direct descendant of Johann Sebastian Bach, Richard David Bach was born in Oak Park, Illinois, to Roland Bach, a former United States Army Chaplain, and Ruth (Shaw) Bach. While attending Long Beach State College in California, he took flying lessons, igniting his lifelong passion for aviation. From 1956-1959 he served in the United States Air Force and earned his pilot wings. In the 1960s he directed the Antique Airplane Association and also worked as a charter pilot, flight instructor, and barnstormer in the Midwest, where he offered plane rides for three dollars a person. During this period, he worked as a free-lance writer, selling articles to Flying, Soaring, Air Facts, and other magazines. He also wrote three books about flying which were Stranger to the Ground (1963), Biplane (1966), and Nothing by Chance (1969). Since Jonathan Livingston Seagull, he has continued to share his philosophies on life, relationships, and reincarnation in six different books. Richard Bach is currently considered a "single author." If one or more works are by a distinct, homonymous authors, go ahead and split the author. Richard Bach is composed of 12 names. You can examine and separate out names.